Have to say I am truly impressed with every single entry. Each one of you have brought something very interesting to the competition. I am going to find this an interesting round to judge. Very well done to all the entrants! Well I turned something in. That was a close one because of my real world responsibilities. Yuck haha. Champ once again you have mastered simple elegance that I try to achieve. JP Thanks for the words of confidence. There was a little more I wanted to show because I felt I didn’t do enough compared to my fellow competitors. As far as the dusk photos, that’s always my favorite time to be at a park. The lights come on and the whole place really comes alive. I’m really glad you liked it. Welcome back to Melody Park! Egad, Champ, that's drop-dead gorgeous. The skyride and beach stuff is great, but your Bourdon Street stuff, especially that Swing Dance sign, is phenomenal. Roll on Challenge 3 - and of course the results for Challenge 2! I'm glad you're enjoying this. I hope this means you'll be in for future contests. I, too, enjoy the format and having to put my crap up for a side-by-side with folks who actually know what they're doing. It definitely helps me, gradually, to get better . Dan, I forgot about your mastery of those dusk/twilight photos. I think I was wiping drool with every picture, but the beach entrance really stood out for me. Yeah, you do certainly like night scenes. I'm really wondering if Expo City is actually a ghosttown which only comes out at night . I don't envy you, but OTOH I'm kinda glad I don't have to compete with you and the other masters who are judging this one . Are we to assume that Pietrix and Turtle are not submitting an entry this round? I finally had a chance to comment on everything: I was a little busy with the real world yesterday, but I liked all the entries so much I wanted to give everyone my specific compliments. PhDisney: I really liked the entrance to the zig-zag path, and the checkers board is really clever. I never would have thought of that in a million years. I am also impressed with how much you did with the screens. FCP-Rug: Your footpath is really smooth and natural looking, and the butterfly house picture is beautiful. I wish I could see more of it. Forgath: I can hardly believe this is your first park: it's really good for just getting started. I especially like your fifth picture: it looks so peaceful. Bullethead: I love your tower. What pieces did you use to make the main part of it to get the cloverleaf shape? The interior of the Tilt-a-Whirl queue is pretty cool, too. JPAlmighT: I love your coaster story: I'm impressed you try to make realistic custom supports at all. The outside of th pirate cave makes me really want to go inside. DragsterDan1987: Your twilight photos are beautiful. I really like your beach sign. What lights did you use for them? champ01: Your SkyRide station looks really realistic and a bit nostalgic. Your New Orleans street looks great, too. I like how your work is really immersive: I really feel like I'm actually at your park. Thanks for letting me join in! I had a blast and am very excited to see the judges' comments. Graystripedkitty- Those letters were a part of the new DLC. Those lights are already a part of the letters. I’m so glad they came out when they did. GSK, thanks for your interest. The tower shape is pretty simple. Each lobe is 2 quarter circle flat tiles. The 3 lobes on the outer sides (the rooms) are set corner to corner. The lobe toward the cliff (the elevator and stairs) is the same but moved out 1m from the corners of the adjacent lobes. Each lobe is surrounded by the circular wall trim pieces. Then 1/4 circle walls liberally plastered with windows and trim. BH - IS that a working in game hotel? Yup. The tower is built in stacks of 3 floors. 2 of those have 3x regular rooms, the 3rd has 2x luxury rooms. You can MAYBE tell the latter by the dividing wall that PERHAPS might be visible if you look REALLY hard at every 3rd floor up from the bottom on the lobe facing the lake. Total of 40 rooms in a ratio of 3:1 regular:luxury, so 30 regular and 10 luxury. The lobby is accessed by a path going through the non-moving double doors visible in the far background of the grotto pic, behind the food court that views the grotto. The top floor of the tower just below the helipad, which is the ONLY floor with lighted windows due to using lit signs instead of lit windows once I became aware of the bug with lit windows, is just empty space I image to be a 5* restaurant. ...The top floor of the tower just below the helipad, which is the ONLY floor with lighted windows due to using lit signs instead of lit windows once I became aware of the bug with lit windows, is just empty space I image to be a 5* restaurant. Which lit signs are you using? And what color do you set them to? I had probably over 500 lit windows on Coney Island, and I'm a little annoyed. I sure as heck hope they can fix it without my having to go back and reassign every single window!!! That upper hotel floor has the small, single-letter lit signs superimposed just behind the small multipane windows, which are only slightly bigger. Then these windows are surrounded by trim pieces to hide the gap between the edges of the frames and the edges of the underlying signs. Whilst the judges are deliberating, what's on everyone's wishlist for Challenge 3? For me - it's probably something like expand into the farmers field, and begin the expansion by building a themed custom coaster, or something similar. Despite the name of the game, I've never felt comfortable with coasters, so a challenge would be an ideal time to get to grips with one. What do I think will happen though? I've got a horrible feeling that it'll be something sadistic like build a coaster on the cliffs near the ice rink plot, as we were told to keep it build-free in challenge 1, and asked not to terraform too much in challenge 2. That would be a killer having to build a coaster on a cliff side! Im not sure if the cliff will be involved in a new challenge. The request to alter as minimal as possible to the cliff in challenge 2 might be just that, to let the 'natural' look intact. 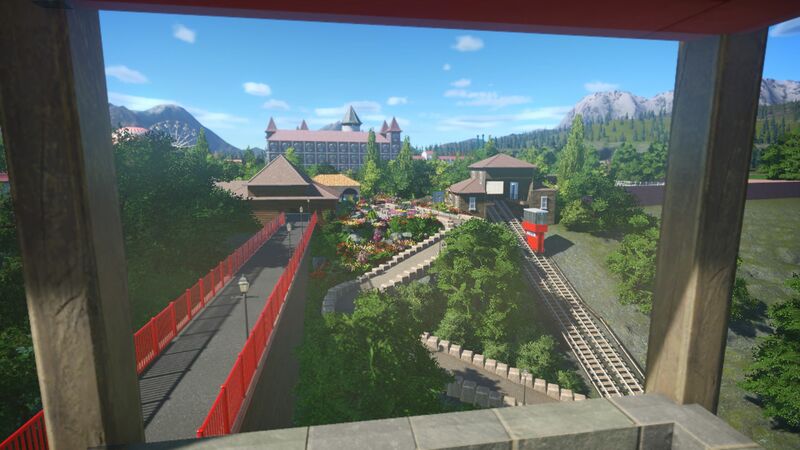 Then again, a cliff might be a nice spot for a mining coaster? I find many things you can do in this game still overwhelming. That includes making a rollercoaster (i havent even touched it ) or making a nice scenery with water and / or waterfall surrounded with rocks. Im thinking we will expand the park on one of the side plots and need to work with a themed area. But so far im enjoying this summer competition alot. I don't think we're diabolical. Often. But thanks for the sadistic ideas!!! I don't think I'm ready for new land yet, I've still got a lot of space to fill on the ice rink plot. Guessing some kind of coaster challenge is coming though, and I would definitely need land for that. In the past Shy has had separate challenges for creating a restaurant, creating a shop, theming flat rides, and I think there was one for doing a dark ride once. I'm actually curious as to whether we'll actually use all three plots? If there are 8 challenges like last summer, I think it'd be possible, but with 5 (like the winter competition) we'd be struggling. Presuming that challenge 8 is a 'finish the park' challenge, if we do have that many, that only leaves us 5 challenges to fill two and a half plots, which might be difficult! What's a roller coaster? Never heard of one. I have some sad news guy's, my computer broke down last week. my motherboard stopped working . so I was unable to build anything for the contest. the big problem is that my motherboard and CPU where a little bit on the older side so I will need to upgrade both. (my CPU wont fit in the newer socket types) I'm currently trying to figure out the best parts so I hope I will be able to build something for the upcoming challenges. Sorry to hear that, Pietrix . I hope you can get things sorted soon and get back into this. Good to see you giving it a try! Looks nice! With 6 judges, the maximum points possible would be 30. The minimum points possible would be 6. Congrats to our winners and those who entered. There is still a single tier but that will be evaluated after challenge 3. Keep up the good work! Judges can now and are asked to post feedback. Check out my latest projects! Re: SGW Summer Competition 2018 - Challenge #2 Winners Posted! Here was all my feedback from this round. Let me know if anyone has questions. Nice work again from everyone. Interesting how many players had budget restriction comments in their descriptions and we don't have any budget restrictions in the objectives this time around. 1st - champ01 - New side entrance looks great…but explain more. Is this a second entrance on the upper level near the front of the park? Either way it’s a very nice quaint entrance. You too added a sky ride…more of a gondola than a chair lift like JP, and maybe even a bit higher on my like scale (sorry JP). The stations are great work and very real looking. Your beach buildings are also very well done...and then I got to your last photos. New Orleans addition put this entry to the top IMO. that addition to the main park was beautiful. Nice work. Only thing I was not clear on is if the beach only access way was done? 2nd - Bullethead - first…did I sense some major aggression and disagreement towards the politicians (judge panel) because of the objectives of having to reach the beach this challenge? LOL. And again…your personal life tie in with the fire prevention details are great. Very ambitious to built such a unique hotel. Just curious...does this have a working hotel feature in the game? the tram track circling the building...while not realistic, still looks great. I also like the cave/grotto idea under the hotel. (how do you guys come up with this stuff?). The overall feel and theme of the upper park is continued down here and the additions all around looks great and meet all objectives. (BTW - the tram is here to stay...the 'council' will make sure to not let you demolish it!). Thanks for the added laughs. 3rd - JPAlmighT - the pier looks great and was a great idea. I also love the chairlift idea. I was wondering if any one would take this approach. When I saw the railway - I was thinking no one would do a chairlift. Thanks for making me happy. Your walkway up the cliffs is the best decorated one of the bunch and I gave you some extra credit for putting in that extra effort alone. you also kept a coherent theme and look/feel to your park from what was in the upper section. Not sure how the beach access only route was addressed, so a red check on that point. I like the space section you added...it does concern me (just a little bit) that you are breaking your overall great theme, but the camping story comment reeled me back in....and mostly because I love the look of Pizza Planet. Runner ups - again very hard to discern between these next entries...very little separated many of these entries and it was little things and style that I had to rely on for the choices. DragsterDan1987 - nice entry. The added ride at the top of the cliffs (and the back of the current park) is a nice addition and would lure guests from the beach up to the park. The vintage pack adds for the beach entrance are really nice looking as well. I also like the lighted gazebos on the beach and the small picnic platform half way down the cliffs. Your path looks inviting and is finished off nicely. Not sure how you addressed the way to the beach without park access? PhDisney - nice work. 3 ways down to the beach and 2 of them were very unique and well done. I realize time is always limited and the work you did was very involved and turned out nice. Maybe you could have limited the beach access down a bit (to one or two methods) and spent a little more time on the actual park? This is not bad, just noticing you tend to lean towards the huge and extreme ideas and don't want this to eat up so much time on your entries and look of the park. After saying this...I still want to make mention that the 3 ways to get down are done very well. The railway was totally different. Also, nice tie in to current events and the World Cup viewing on the beach. I also really like the little garden area at the top of the hill/cliffs. FCP-Rug - nice entry. The walkway up/down the cliff would be much easier if you were going down, but nice dirt work and path placement. Not real clear, but is that an actual working pathway? The idea of improving the beach is also different and the way you handled it was unique. Again, it your idea that the beach is actually not usable yet for guests because its still being restored? The butterfly garden was a nice touch and something unique. I also like the way your style and look (like the signage) matches what you did on the upper entrance. It would have been a bit better if you were more clear on what else was added in this area, like ticket booth, bathrooms. etc. as many assumptions need to be made. Forgath - I like that you added building on the beach that are appropriate for the beach. Like the dockside food/etc. building and the lifeguard/first aid station. Beach umbrellas are also always very nice. Looks like the beach is a bit lumpy but its great you tried to make it better. The nice covered boardwalk is also a great addition. Challenge objectives like the path and tracked ride were meet, but I personally would like to see them spruced up a bit more in the future....the base work is there, now make them look great. I can't stress enough (to all contestants) to be sure to call out what you did to meet the objectives so the judges can accurately and fairly determine if they were met. I see you added a building at the new entrance, but does it have a ticket booth, bathrooms, etc. It would be great to know all this detail that is not obvious in the photos. Graystripedkitty - First - Glad to see you submitting an entry..better late than never. Interesting take on pretty much eliminating the beach (for swimming) and putting in the pier/walkway. I guess if the beach is being used for camping, etc…the pier can be for fishing. I see you did leave part of the beach there at the far edge, so maybe you could have made the entry a bit more usable for the guests that do want to swim. The walkway up and down was done well, with the flat sections for viewing and resting. Most all objectives were meet and the park area at the top of the hill are a good basic start. As far as getting ideas on park design and what to add...just scan through the forums and look what others are doing and you can learn a lot from that. I don't disagree with anything Wowman, in fact I'm impressed with my score given that the "beach only" access requirement was not addressed. I partly misunderstood, but I also think it was very redundant with the existing road since the beach either has actual or implied parking since it's always been there and the park is new. I was thinking of an option yesterday that may or may not work in this or other competitions... if we don't have enough players for a tier system, what about continuing with the "2 option" system, with one of those options having a higher degree of difficulty for more experienced players? And then if an experienced person backs down to the 2nd option (like I'm doing for challenge 3) they'd be eligible for less points? Just brainstorming, I'll let you guys decide if that works. Not sure if it might be a way of leveling the field for new people or not. Regardless, congrats to champ and everyone, and welcome aboard Jay! Thanks for the results, and the first bit of feedback. I'm fairly happy with 3rd place (4th in reality), which keeps me 4th overall. About as much as I can expect being a newish player up against some very, very good competition. In terms of tiers - personally I wouldn't like to see them introduced at this stage. With Turtle not entering this round, and Paterdave2 dropping out (apologies if I'm wrong on either point), we technically have 11 entrants, but in reality this number is likely to be nearer 6-8 by the time the competition concludes. I think having two tiers of 3/4 players takes away from the excitement of trying to sneak into those top three spots each week. If Tier 2, for example, ended up with 3 players, you could practically do nothing and finish 3rd every time. Not exciting in the slightest. Looking at the current points, my personal objective is to try and catch one of the top three, even if that is getting more points than one of them in one of the challenges! For those at the current bottom end, they will be eyeing up catching myself on 25pts, or FCP-Rug on 20. I think having a larger league table and one big competition benefits everyone. It is a pleasure to be in a competition with fine, established players, as well as those who are complete beginners who are being inspired by those at the top. I agree. 8 entrants is not enough to warrant a 2 tier system. Still contemplating something to make it more worthwhile for the "beginners". It will all depend on whether or not we have more drop outs.